These free house building plans will provide you with ideas for construction that 4 bedroom dream home that you have always wanted. 4 Bedroom House Plan available for a small fee. Build this 26&apos; × 46&apos; 4 bedroom house. These house plans feature 2 bathrooms, gable roof, stud walls and a concrete floor. Build this 43&apos; × 76&apos; U shaped 4 bedroom house. These house plans feature a patio, porch, truss rafters, stud walls and a concrete floor. Build this 26&apos; × 40&apos;, 2 story 4 bedroom house with a 22&apos; × 39&apos; garage. These house plans feature truss rafters and a basement. Build this 24&apos; × 36&apos;, 1 1/2 story 4 bedroom house. 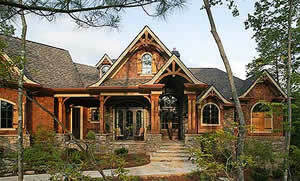 These house plans feature 1 bathroom, vertical siding, post and beam construction and wood floors. Build this contemporary, 2 story, 1400 sq. ft. 4 bedroom house. These house plans feature decks, solar attic and a basement. Build this 36&apos; × 80&apos; L shaped 4 bedroom house. These house plans feature a double carport, sloped ceilings, fireplace, brick veneer exterior and a concrete floor. Build this 28&apos; × 58&apos;, 1 and 2 story colonial 4 bedroom house. These house plans feature a family room, 3 bathrooms, carport, fireplace, truss rafters and a basement. Build this 2100 sq. ft. 4 bedroom house. These house plans feature a double garage, deck, den, gable roof and a raised wood floor.